This is actually terrifying. If I were 6 this would’ve given me nightmares. That said, let’s break it down some. He’s wearing a purple surgical glove, an obvious homage to his usual purple attire. And his bright green hair is another obvious trait. But gone are the days of the Joker being the insane clown. Now we appear to have an insane …skinhead? The tattoos on him are simple enough to break down. The maniacal laughter (“HAHAHA”) that we see over his left breast and arm are staples to the Joker’s insanity, as often seen floating around him in comic panels. The skull over the left breast is wearing a joker hat. The crazy smile over the right arm is pretty striking as well. The “damaged” tattoo on the forehead is obvious (but I thought crazy didn’t know they were crazy?). Also looks like he doesn’t keep great care of his teeth. Also, plenty of desaturation to make him undoubtedly more freakish and pale. If this is what the Joker looks like, what can we expect of Harley Quinn? Despite being rather scared of him, Jared Leto is an excellent actor and I’m looking forward to seeing this new side of him, for better or worse – but I have my reservations. What do you guys think? Pingback: The 52 NOW! The Joker breaks the Status Quo (and the Internet) | Zowie Kerpowey! I’ve heard his joker voice and was pretty impressed. It’s super brief, you can find it on youtube. When I think about it now I wouldn’t say impressed, just that I feel he’s going in the right direction with it. I’m mildly interested. At first glance this doesn’t sell me, but then again I thought Heath Ledger as the Joker would fail miserably. I got that one wrong, and I hope my gut reaction to this one turns out wrong too. I’m not impressed. Of course he’s crazy but does it need to be written across his forehead? As cool as this looks, I’m hoping we also see him in the classic suit… or some awesome variation thereof. Can’t wait to see how he does in the role either way! DC seem to have the idea right now that they need to mess with everything to remove any humour whatsoever. Which is kinda the opposite of what the Joker’s about… they had to tattoo the word “damaged” on his head just we know he’s crazy. 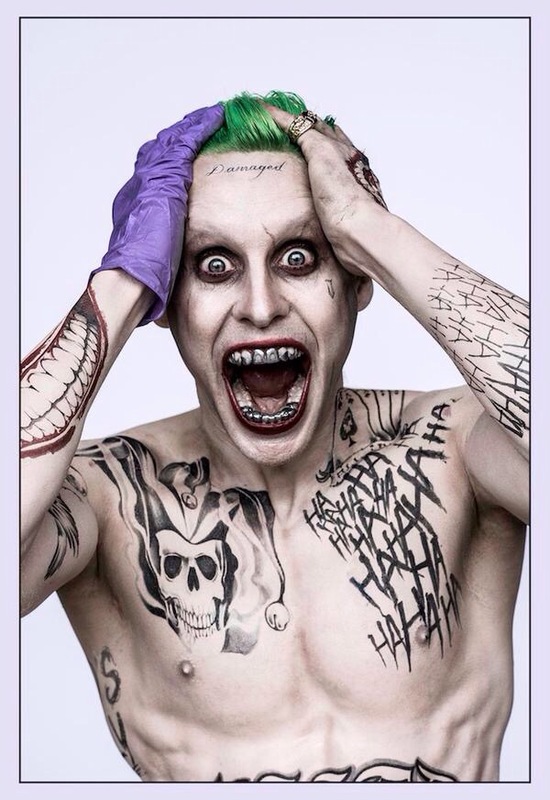 Either way, I once heard Jared Leto’s psycho laugh, and it’s actually rather terrifying. So hopefully this will fit with his characterisation of it rather than just being there to be arty. It’s as if the DC Cinematic Universe they have in the works is an alternate reality universe/continuity than they have from their comics in which they can be as dark as possible. Not too bad… actually it isn’t that far off from the look of the Killing Joke version of the Joker… minus his usually suit/tie look that is. I could see the Joker having crazy tattoos… I could also see him having a unicorn and a rainbow tattoo as well, just to surprise you! Looks to me like they’re trying to get in on the darker, grittier side that DC movies have taken on lately. The creepiest part of this is that this looks like a guy you could walk by on the street and never even know it.